Are you looking for a healthy snack for your kids? Are you tired of struggling to find healthy snacks that your kids actually enjoy eating? One way of providing your children with both nutritious and delicious snacks is by feeding them natural, healthy fruit snacks that contain natural ingredients, such as natural fruit and vegetable juices. 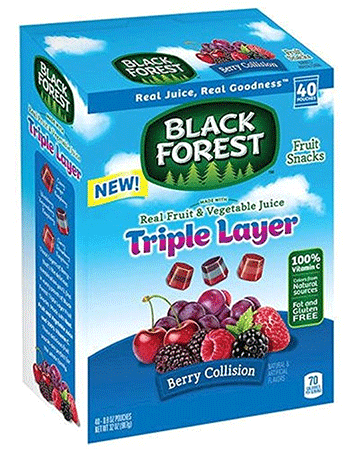 The Black Forest Berry Fruit Snacks, in the Berry Collisions flavor, are made with real and natural fruit and vegetable juice, and are also gluten free and fat free. A serving of these fruit snacks will also offer your child 100% of their daily vitamin c intake. Each box comes with 40 pouches of fruit snacks at 0.8 ounces per pouch. Good for on the go snacking. These Curious George Fruit Flavored Snacks are sure to be a great snack for curious kids! These fruit snacks come in assorted flavors, and there are 5 pouches per box, at 0.8 ounces per pouch. 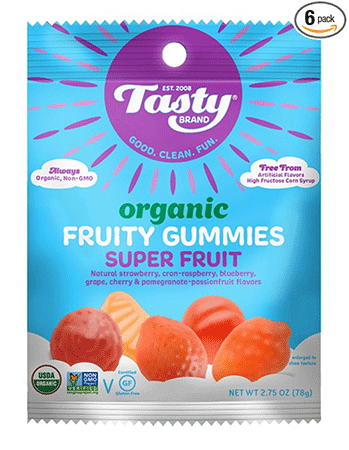 These Tasty Brand Organic Fruit Snacks in the Superfruit flavor are packed with healthy options and variety. This pack of fruit snacks contain the flavors strawberry, cran-raspberry, blueberry, grape, cherry, and pomegranate-passion fruit, with acai and super fruit powder mixed in for added fruit flavor.This company was founded by two mothers looking for healthy snacks for their kids, so you can rest easy when you buy this brand! These Betty Crocker Fruit Flavored Snacks Variety Pack are sure to be a hit. 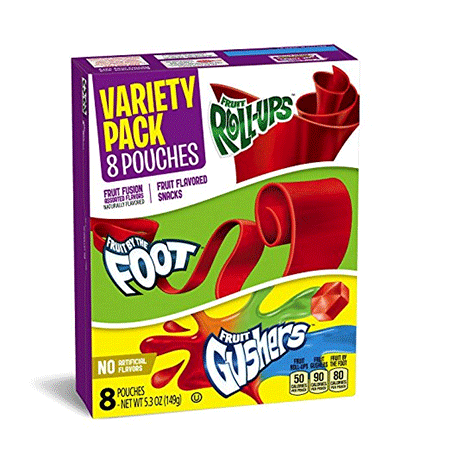 These are a classic fruit snack for your kids that they are sure to enjoy. Each box comes with eight pouches. The Nature’s Bandit’s Organic Fruit and Veggie Stix come with 5 individual bags per box, at .6 ounces each. These fruit and veggie snacks will be especially fun for kids because each box comes with two collectible trading cards! This fruit snack is a little different than the others that have been mentioned. If you’re looking for a fruit snack for your kids that isn’t a gummy snack, then this might be right for you. 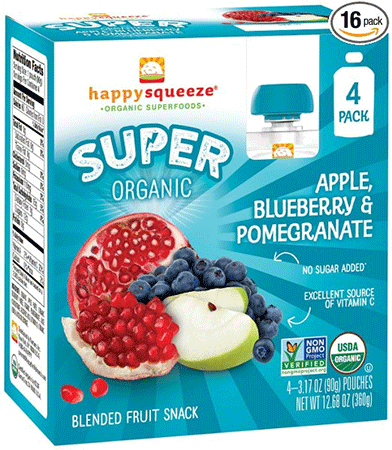 The Happy Squeeze Organic Superfoods snacks are pouches of pureed fruit that will provide kids with a completely different kind of fruit flavored snack. Each box comes with 4 pouches, at 3.17 ounces each. 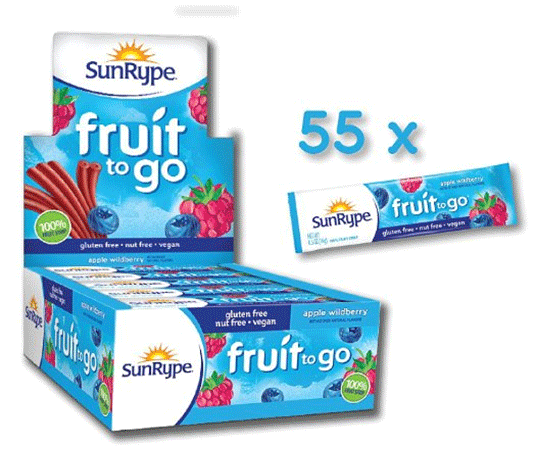 These SunRype Wildberry Fruit to Go 100% Fruit Strips are 100% natural made fruit bars that are guaranteed to have your kids reaching for more. You could easily slip one of these in to your child’s lunchbox, or take one in the car for emergency snacking. Each box comes with 55 fruit strips, at .5 ounces each. 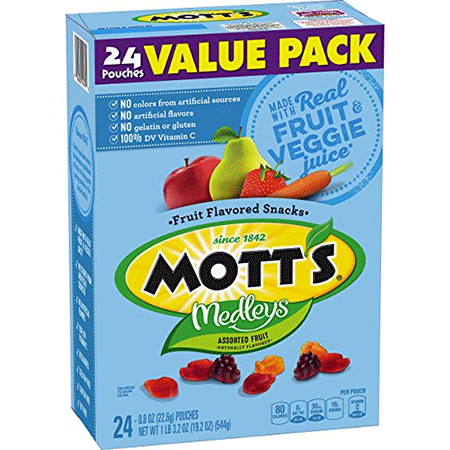 The Mott’s Assorted Fruit Flavors Value Pack comes with twenty-four pouches, at 0.8 ounces per pouch. Mott’s is a very popular snack brand amongst children. These Annie’s Organic Bunny Fruit Snacks are a popular, healthy fruit snack amongst children and adults alike! Each box comes with 5 pouches at .8 ounces each. These fruit snacks also come in fun bunny shapes that are sure to make them fun to eat! Annie’s Organic Bunny Fruit Snacks in the variety pack are by far the most popular and healthy fruit snack for kids! With this option, you can give your kids a variety of flavors, including the summer strawberry mentioned previously. The other flavors offered in this variety pack are Berry Patch, Sunny Citrus, and Tropical Treat. If you have children that enjoy a wider variety of flavors when they have snacks, then this box of fruit snacks is for them. Each box contains 24 pouches of fruit snacks, at 0.8 ounces each. With the help of this list, you will surely find a snack that is healthy, budget friendly, and loved by your kids. Whether you, as a parent, have concerns about how much sugar your children are consuming, or concerns about food allergies, there is a fruit snack on this list made with your family in mind.